On this day in 1984, Alex Ramos and Curtis brawled it out over twelve rounds in a bout for the USBA middleweight title at Harrah's Marina Hotel Casino in Atlantic City. Parker was a late substitute in this fight, stepping in on three-days notice when Ramos' original opponent, Wilford Scypion, revealed that he would not make the 160 pound weight limit. Parker grabbed the opportunity and made a great fight of it. Although Ramos was expected to use his excellent jab and superior movement to easily outbox the forward-moving Parker, it was Curtis that set the pattern of the bout. Parker worked to the inside and stayed at close quarters for much of the way. But Ramos responded well and brawled it out with his hard-charging opponent. They exchanged hard blows to the head and body and made a great action fight. 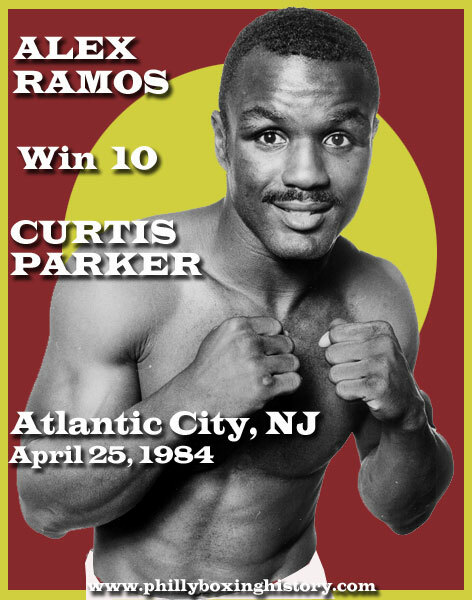 Ramos started to pile up rounds to his credit but then Parker surged back in the middle rounds. The fight appeared close but by the end, the official scores favored Ramos by a wide margin - 116-113, 116-112, & 117-112 all for Alex.